If you live in a small apartment and you have children, you might feel overwhelmed and overrun by toys, clothing, papers, and the other accouterments of raising children. If you like where you live, there’s no need to move into a large house; it’s perfectly doable to have happy children in an apartment! What you need are solutions to the kid-clutter quandary: What should you do with all of their stuff? Check out these ideas for keeping your kids’ stuff corralled and contained so you aren’t stepping on toys or tripping over their clothes anymore. 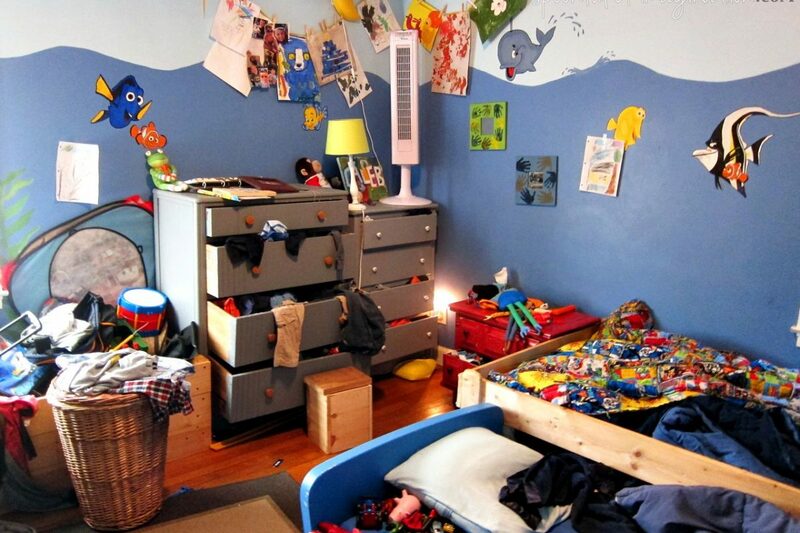 Sometimes, kids just have too many things to fit comfortably and neatly in a home of any size. Take some time to go through their closets and toy boxes or shelves to weed out items that they’re not using anymore. For younger children, this might need to be done when they’re not home or otherwise engaged with something else, but older kids and teens should be helping to go through their things periodically. Donate unwanted items to a thrift shop or put it aside for the next community yard sale. Small children might not be able to reach their clothing rod, which makes it difficult for them to hang their clothes properly. This results in piles of sweatshirts and pants on the floor of the closet, leading to frustration and tears in the morning. Stop this cycle in its tracks by thinking about how you can make their close more kid-friendly. One way is to install a tension rod a couple of feet below the main clothing rod. They can use that to hang their clothes and it will be at a kid-friendly height. As a bonus, it doesn’t require any special tools and won’t mark the walls of the closet, so you won’t have any repairs to do if you decide to move. Another is to buy an inexpensive bookshelf with wide shelves and put that in their closet. (Check yard sales and thrift stores so you can buy one without breaking the budget.) Place plastic tubs or baskets on the shelves and let your children put their underwear, socks, belts, hair accessories, and other small items in the baskets. Sweaters and jeans can be folded and stacked on the bottom shelf. This might even eliminate the need for a bureau in the room, which can open up more space. If you have a chest in the living room that can hold toys and double as a coffee table, you will be minimizing the number of furniture pieces taking up room. A storage bench can be a good place for kids to sit and take their shoes off when they walk into the apartment. If you want to wall off part of your living room to use as a playroom, a few bookshelves can act as a physical boundary as well as storage space. And you can use ottomans as kid-seating to reduce the need for buying child-sized furniture. Making a small apartment work well for your family is a matter of thinking about how each piece can be used to maximize storage potential while minimizing extra clutter. If your kids are small, keeping their items streamlined is a great way to teach them early that they don’t need a lot of belongings to be happy. If they’re older, living in a small space will train them to keep things neat and tidy, which is a skill that will serve them well all of their lives. Don’t feel as though you have to move out of your home in order to accommodate your children’s toys. There are plenty of ways to keep your home neat while also providing them the space they need for their things. Look for specific products on Family Living Today, where you can find reviews from parents just like you!